BC’s best ice cream: discover our local ice cream and gelato artisans, according to you! Summer contest: Show us how you’re #LivinLaVidaLocalBC and you could win big! How do you decide what makes a local ice cream parlour your personal favourite? Is it the smell of toasting waffle cones when you walk in, the way the staff always scoop a little extra on the cone? Is it the memories you make there, waiting in line on a warm midsummer evening? Or is it the unique flavours they feature, like whiskey hazelnut, lemon meringue, miso ginger or honey lavender? When we asked you about your favourite ice cream producers, you shared the best places across BC to get your favourite frozen flavours made from locally sourced ingredients. Below, we’ve got the scoop on the best places to get ice cream and gelato this summer, from Prince George to Courtenay to Fernie. And, while you use our list to plan your next ice cream outing, enjoy these tasty recipes below. Ready to go exploring? Our crowd-sourced list from our Facebook community is the perfect guide to summer artisanal ice cream adventures. Alice & Brohm Real Fruit Ice Cream in Squamish. Community member Katie Youwe says: “Local BC products and made-to-order ice cream.” That’s because they blend fruit and ice cream while you wait, New Zealand style! Birchwood Dairy Farm in Abbotsford, BC. Try the Black Raspberry Cheesecake.They also supply the milk for Rain or Shine Ice Cream further down this list. Betterwith Ice Cream in Metro Vancouver. Cremino Gelato and Caffe in Maple Ridge. Earnest Ice Cream in Metro Vancouver. Their small batch approach makes for surprising seasonal BC flavours, like Spruce! Milner Valley Cheese in Milner Valley, Langley. They feature goat’s milk gelato. “SO AMAZING” says community member Marie Hayden. Rain or Shine Ice Cream in Metro Vancouver. They produce Philadelphia-style ice cream, meaning 100% dairy with no eggs, and lots of gluten-free options. Rocky Point Ice Cream in Port Moody. Rooster's Ice Cream Bar in East Vancouver. SassyMack's ice cream in Powell River. Try the Blueberry Bay with Gin. Welcome Parlour in North Vancouver. D Dutchmen Dairy in Sicamous. Try the Peanut Butter and Jam. Happy Cow in Fernie. They have Huckleberry this summer! Carmelis Goat Cheese Artisan near Okanagan Lake. They offer 24 flavours of goat cheese gelato. Moolix in Kelowna. A neighbourhood institution, Moolix gets packed fast on summer nights. Cold Comfort in Victoria is a local favourite. Try their Hoyne’s Dark Matter Beer ice cream. Coleman Meadows Farm in Courtenay produces their own water buffalo ice cream and gelato, and is the supplier for Hot Chocolates ice cream further down this list! Combs Country Candy in Port Alberni. Island Farmsin Victoria. Their factory tours are a family favourite. Kid Sister Ice Cream in Victoria. Community member Lyndsey Bishop says: “Fantastic ice cream made by fantastic people!” Try their lemon meringue! Frozen Paddle in Prince George. During the winter, they offer a subscription service that delivers three flavours monthly - sounds like a delicious way to get through the cold season to us! 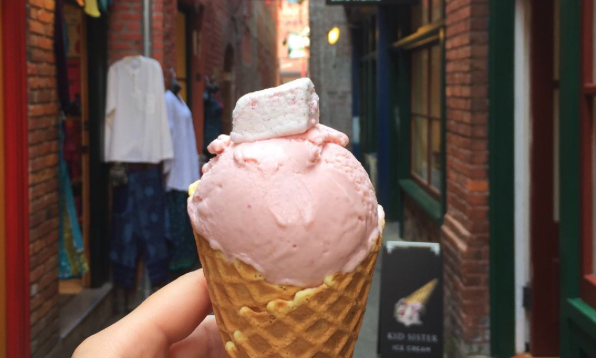 If you want to walk off some of these ice cream adventures (and you’re on a quest for unusual flavours) Off the Eaten Track has an entire tour dedicated to gourmet local ice cream in Vancouver! And if we’ve missed your favourite ice cream producer, please add them in the comments. Hungry for more? Join our Facebook or Instagram community for a fresh mix of local favourites and summer recipes you’ll love. How do you decide what makes a local ice cream parlour your personal favourite?